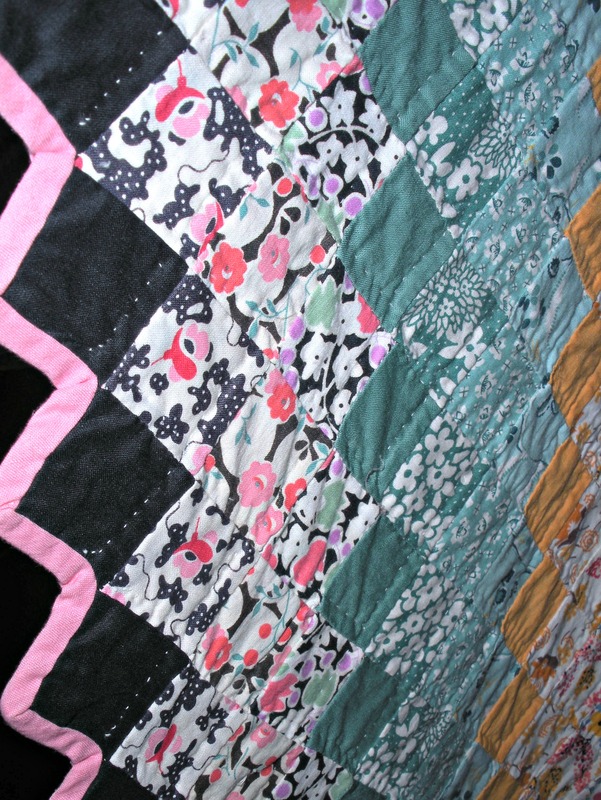 There were just a few applique quilts amongst those on display at Living History Farms the weekend before last. But they were all full-size, detailed hand applique, and worth taking the time to show you… even if you never make a hand applique quilt yourself! I think the label called it a “Rose of Sharon” variation, but if it is, it’s a very simplified variation. 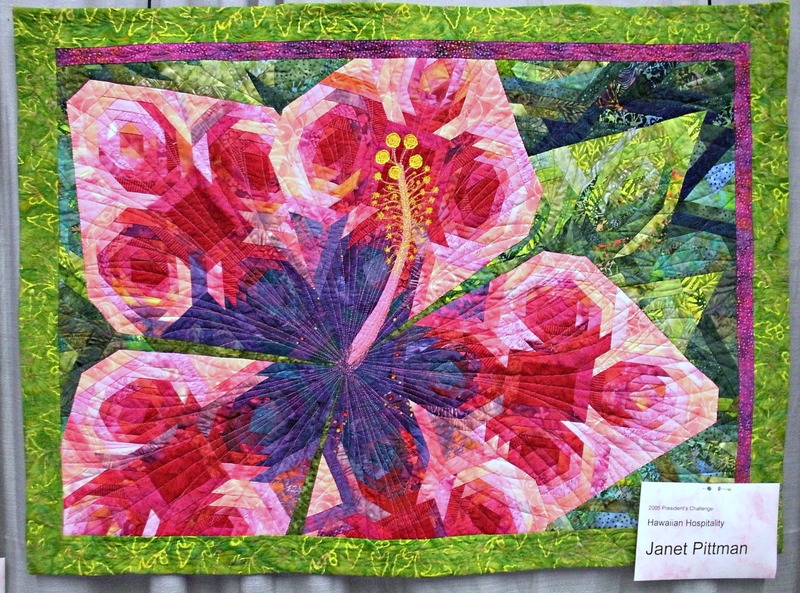 I think it resembles more closely a poinsettia applique pattern I have seen before. Any thoughts on that? 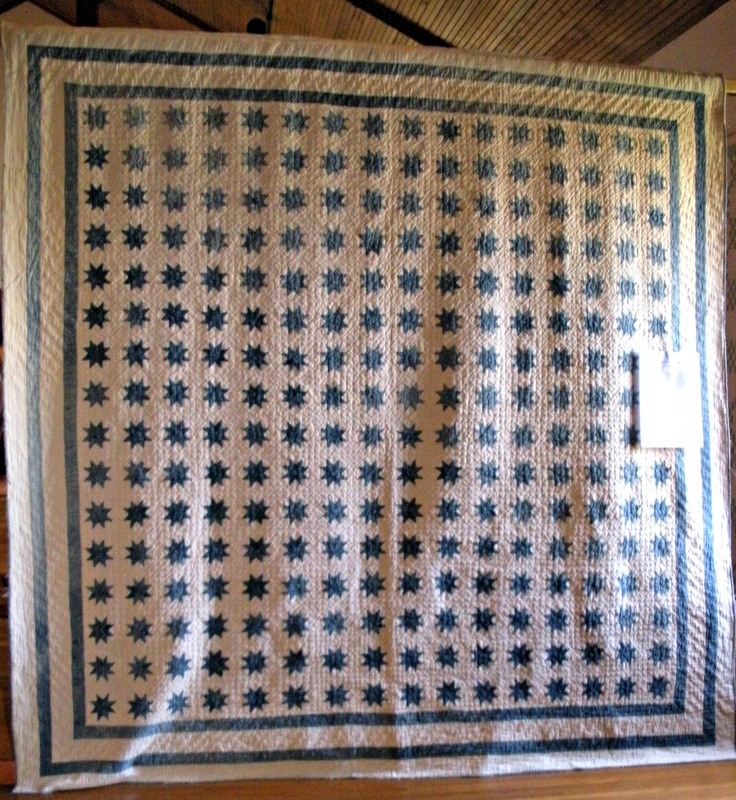 It looks like it is just a top (or a flimsy), but it was quilted, without batting and therefore referred to as a summer coverlet/quilt. 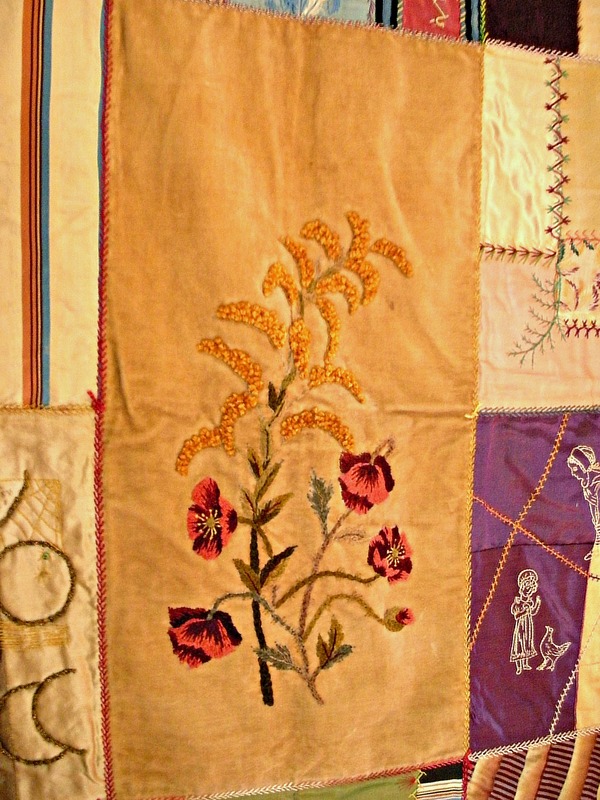 This one is an older example of applique using chintz fabrics (c. 1850). 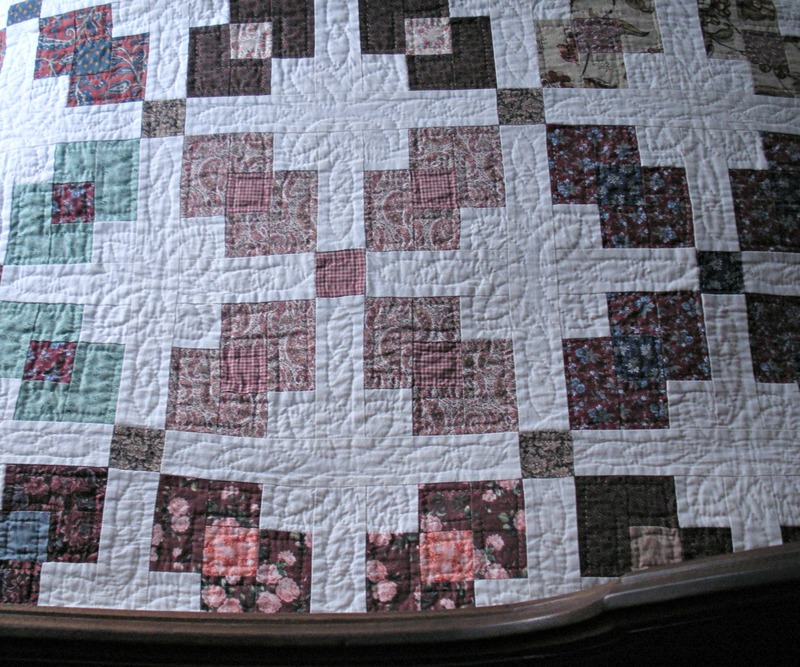 The brown spots are from moisture staining over the years, and the fact that they believe this quilt has never been washed. 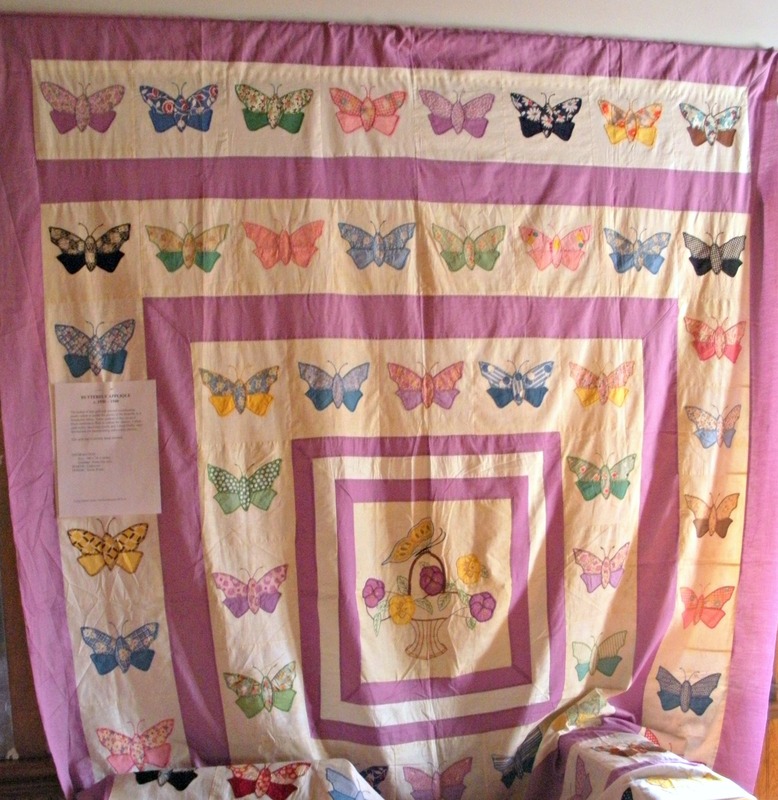 A quilt collects dry soil (dust, etc.) over time and when exposed to small amounts of moisture (humidity, etc) the dust/soil leaves a rust-like mark. There were at least nine of these large applique “bouquet” motifs, and this was the least stained example I could find to photograph. 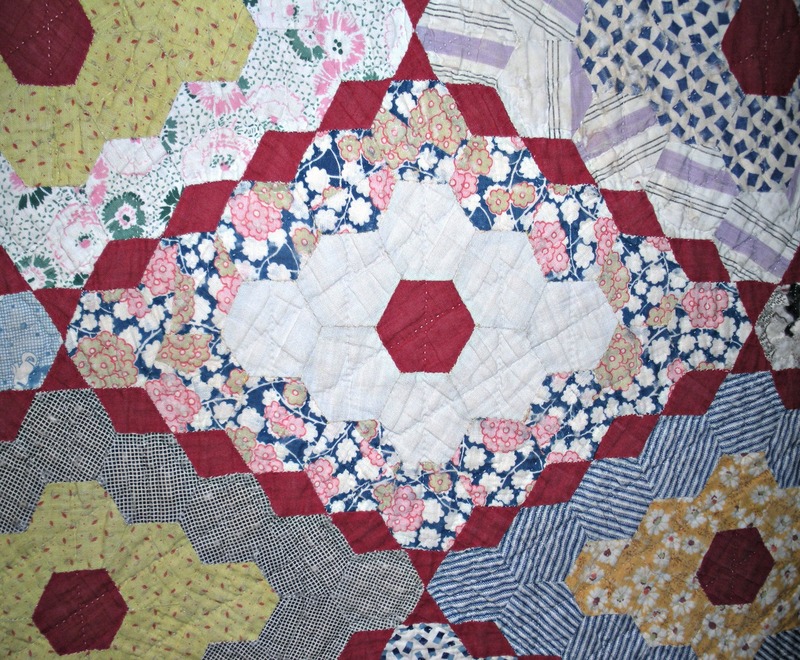 As you can see, some of the fabric petals have disintegrated or been worn away, but it is still a gorgeous example of chintz quilting! 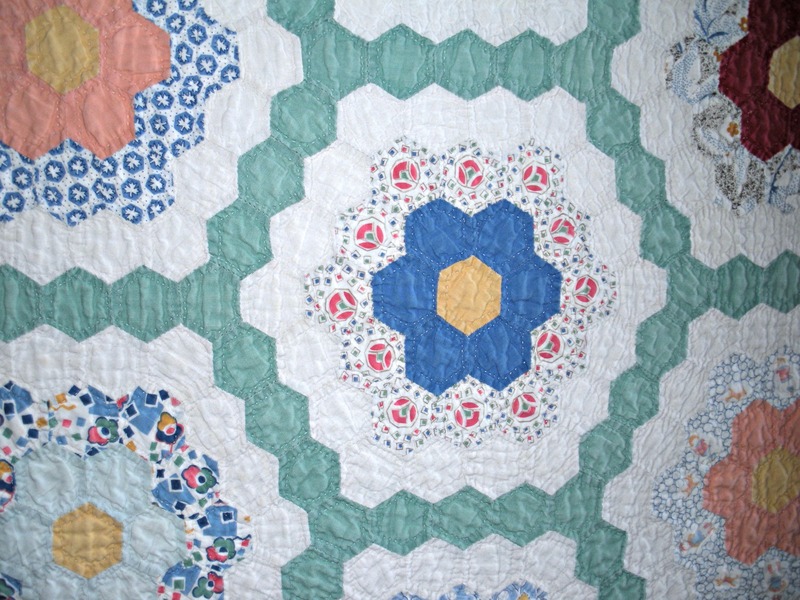 I hope you enjoyed seeing these vintage examples, and that they inspire your modern quilting! 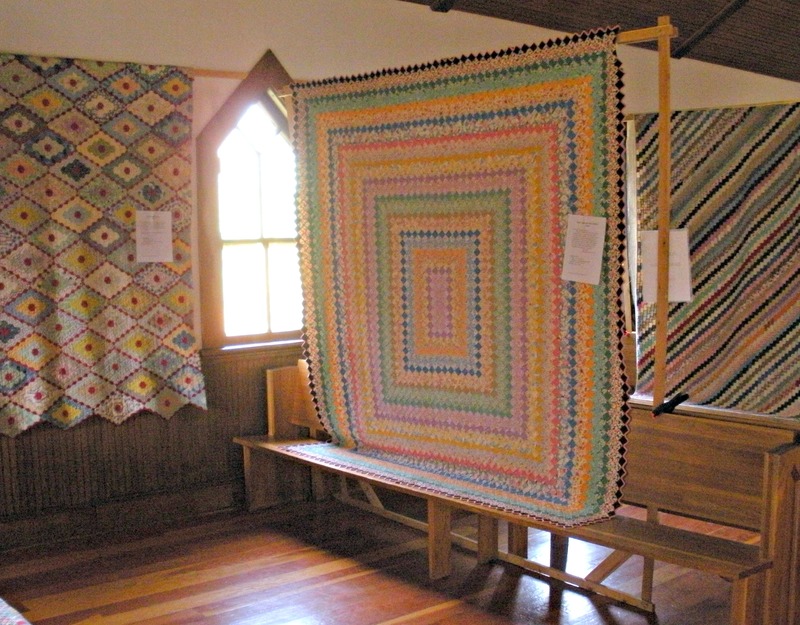 If you have a museum or library, etc., in your “neck of the woods” that displays vintage quilts from time to time, I’d highly recommend making the effort to go see them. Just admiring the hand work from a century ago is worthwhile, and it always pays to support our cultural institutions by utilizing them. 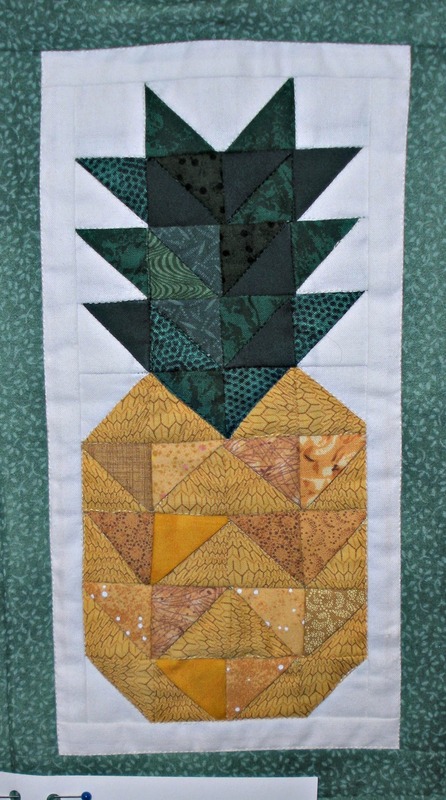 Do you do applique projects at all? 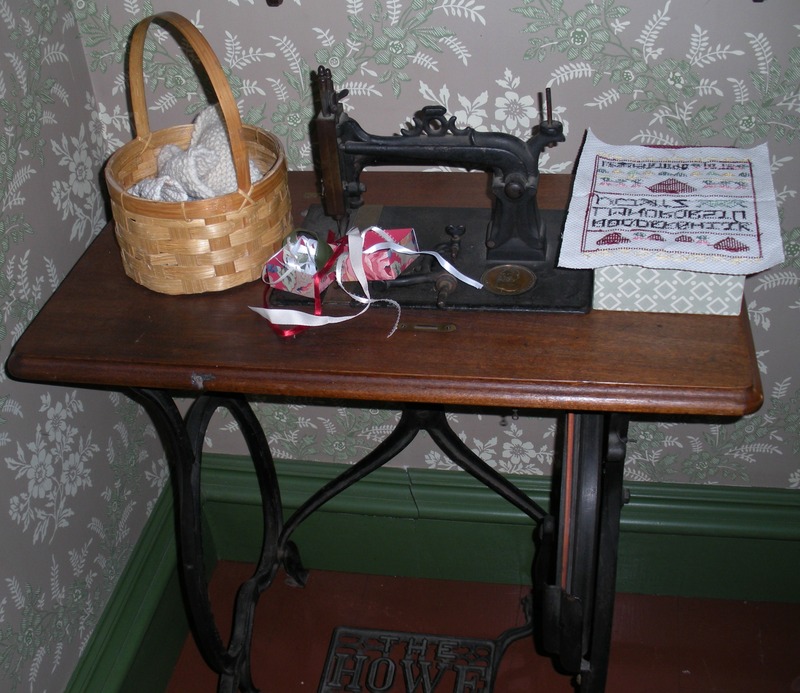 If so, do you hand-applique, or only by machine? 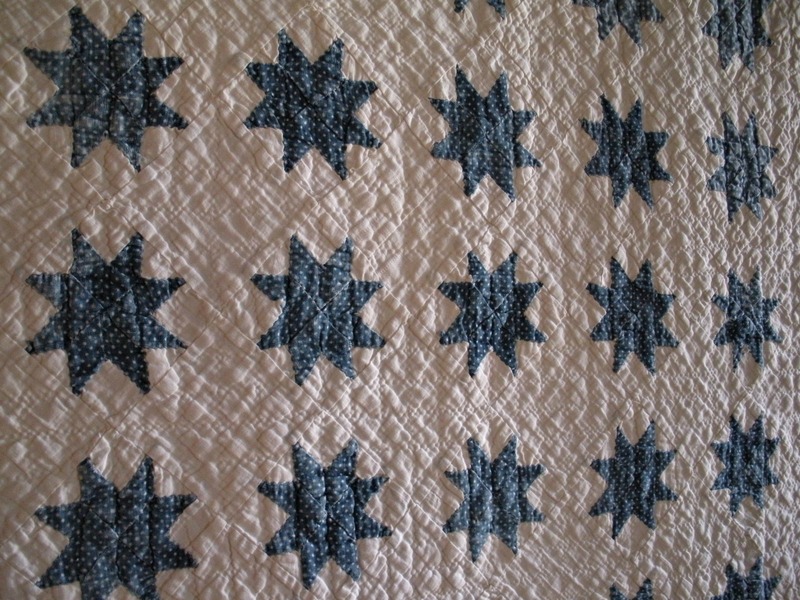 I’m not sure when the Trip Around the World quilt pattern first came into being, but back in the day, the squares were pieced individually, often times hand-pieced. 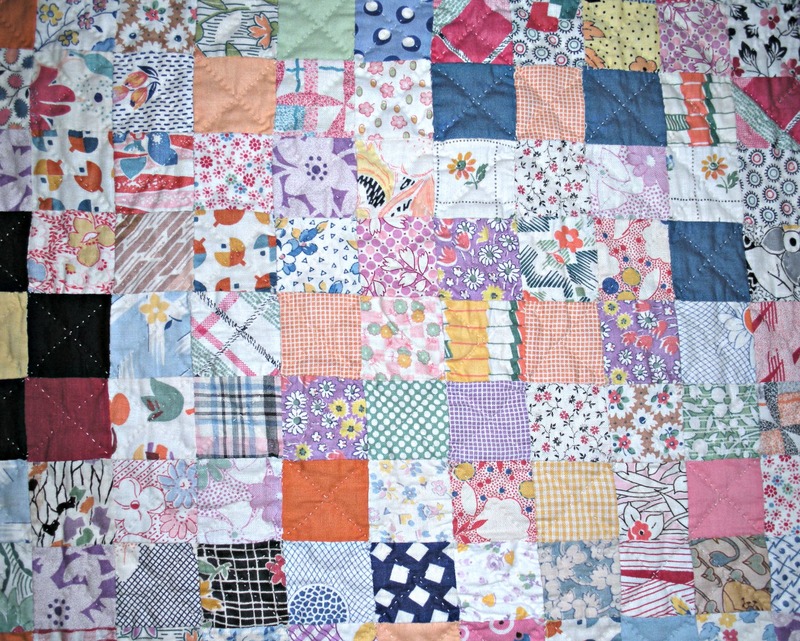 I remember, when I was small, my mom had one laid out on our basement floor (the pieces were all clothing scraps, of 1960s-1970s double-knits–it lives with my sister today). 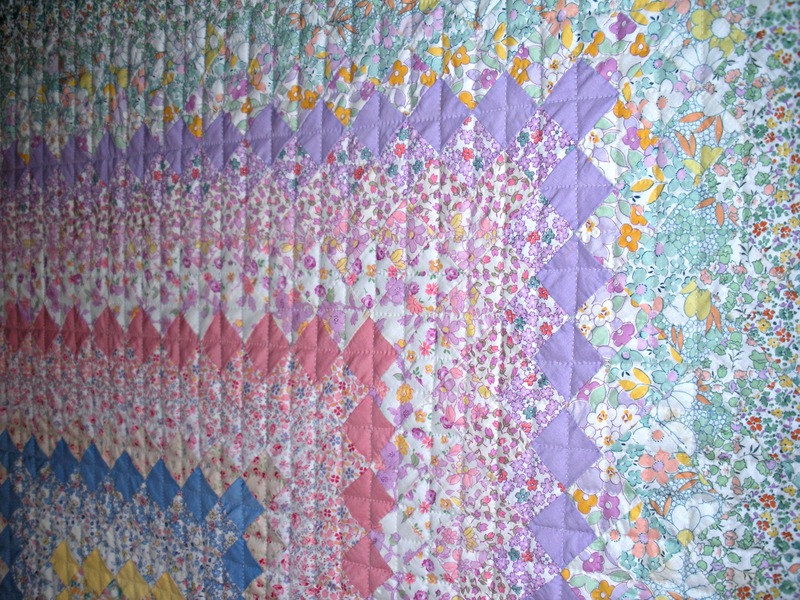 She had it laid out and carefully pinned, and as she tells the story, on more than one occasion, my little brother and I went down to the basement to play and would shuffle our feet across/through her quilt top, so she had to start again laying it all out. Hearsay? 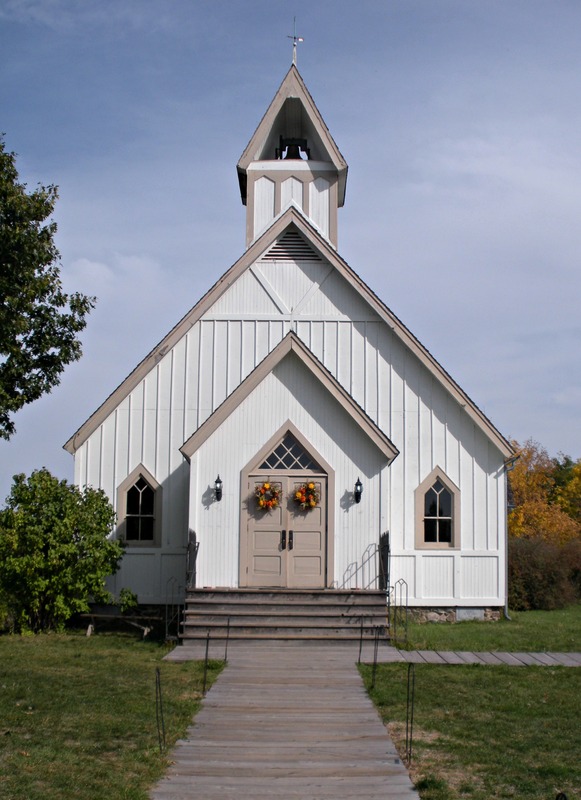 Could be, I only remember the pieces and the pins, I don’t recall the mischief making I allegedly partook in. Have you ever made a Trip Around the World (or a variation)? 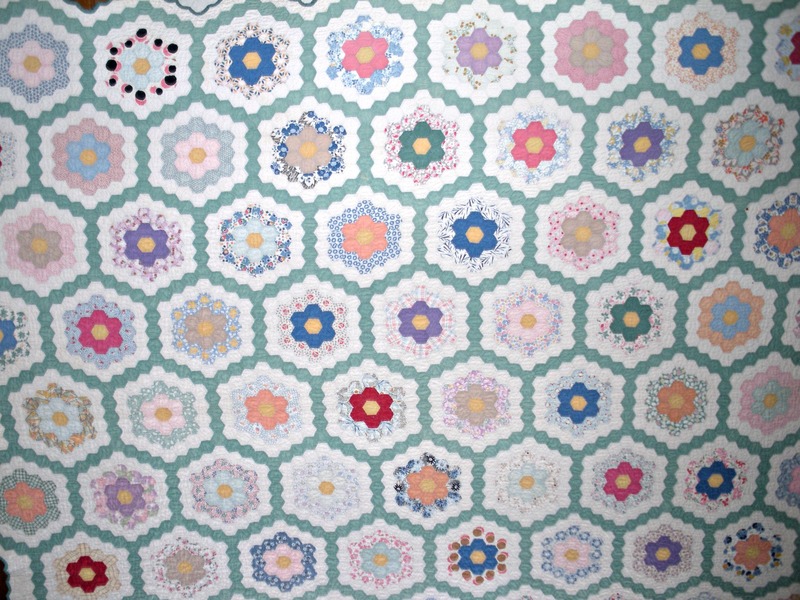 Is this a quilt pattern that is on your Bucket List? 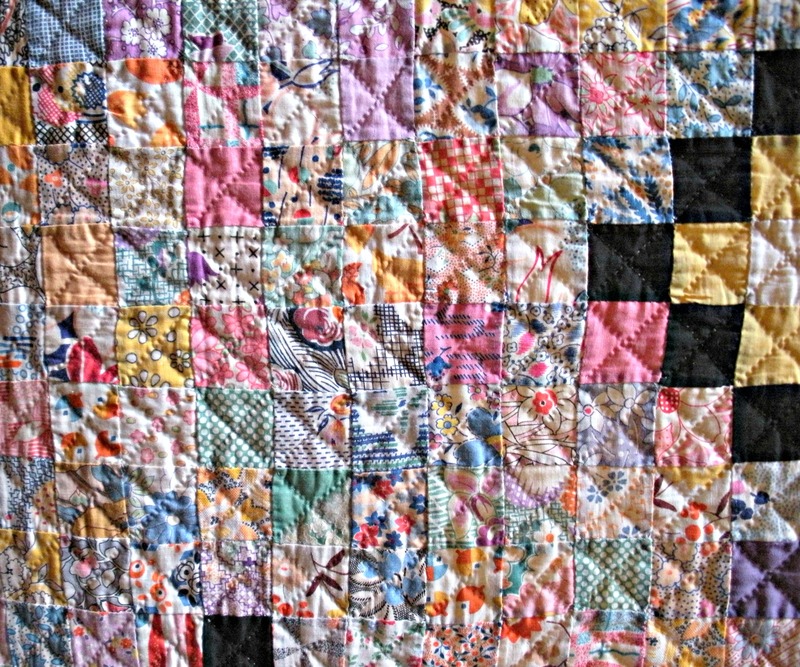 I’ve heard some of today’s modern quilters (self-proclaimed Modern Quilters) make the statement that they don’t care for vintage quilts, or that vintage quilts lack creativity, etc. To me, those statements seem narrow-minded. 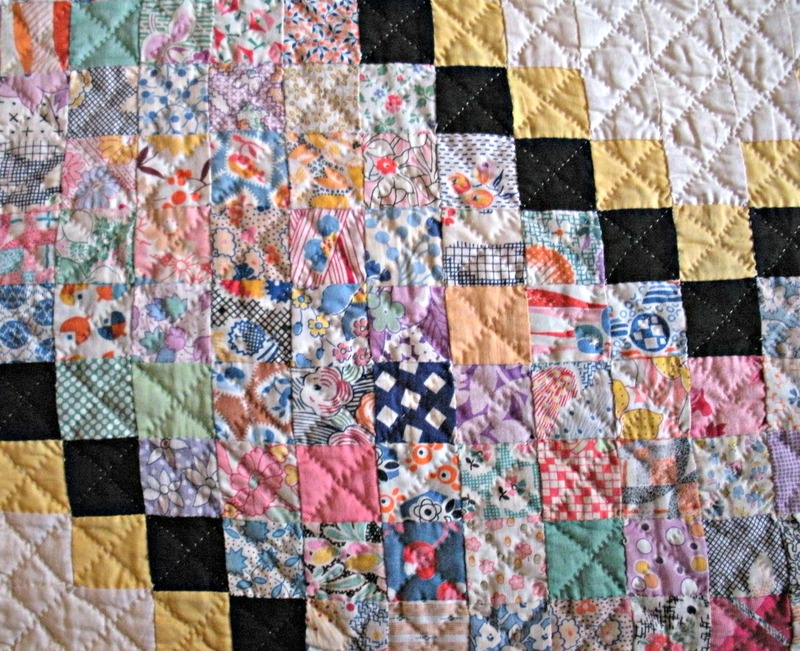 Our modern quilting, or contemporary quiltmaking, wouldn’t be what it is without the patchwork quilts of the past, the innovation of new block designs spread across the nation and world through newspaper features and mail-order, and the individual re-interpretation over the years of these same designs. 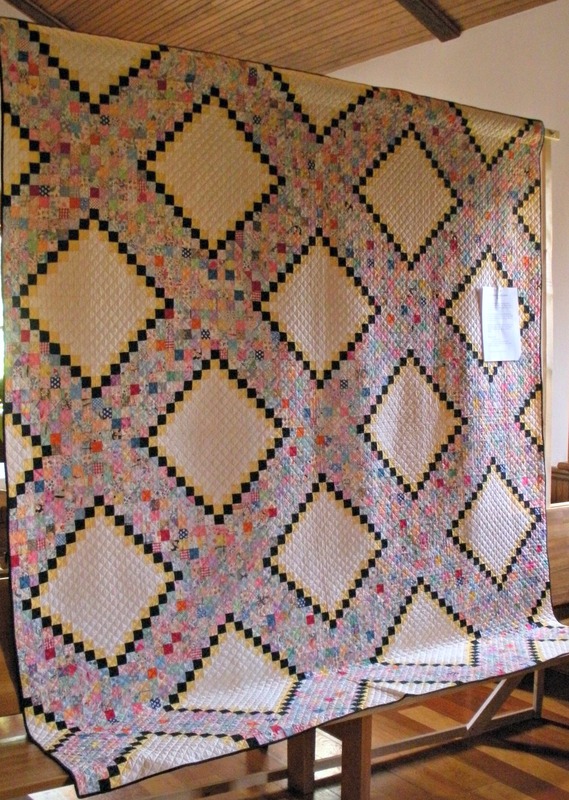 These English paper-pieced diamond blocks use some of the most contemporary and fun looking fabrics! 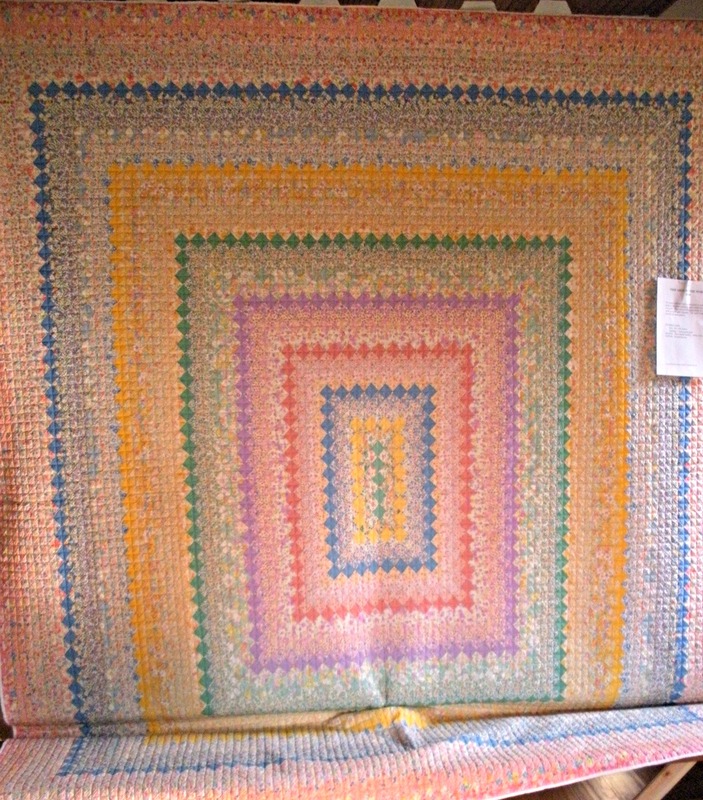 It’s a wonderful quilt; I could see this being made in 2012 and posted to a modern quilt group on flickr, couldn’t you? 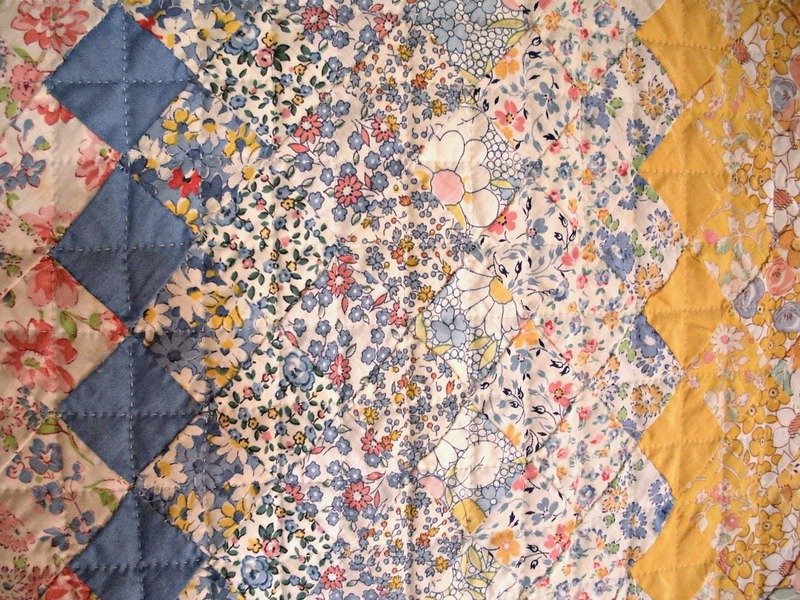 And Grandmother’s flower garden, all the modern EPP hexies we see on blogs and flickr… well, it first appeared in Godey’s Lady’s Book (a journal) in January 1935. How cool is it that this design has lasted the test of time and is still considered creative, clever, fun, and worth making!?! 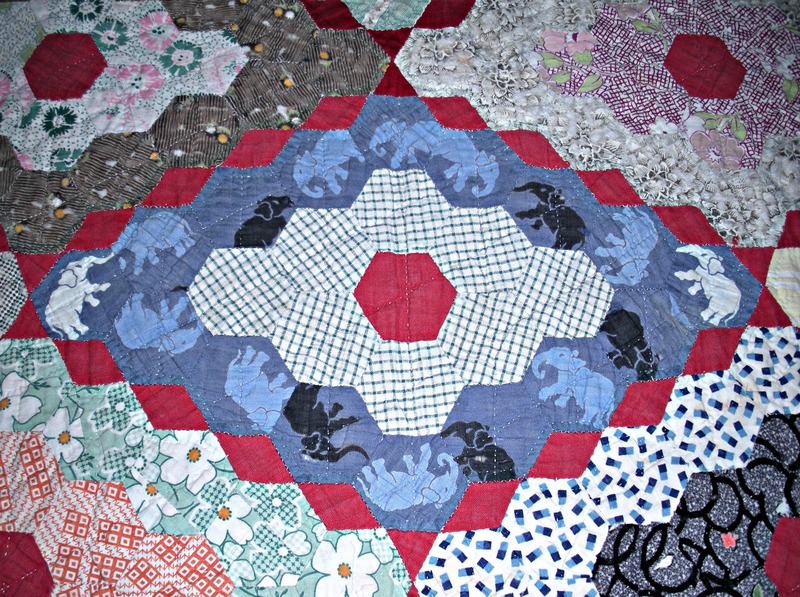 Now, I’m not suggesting as a quilter that you have to like every quilt you see. Lord knows, I don’t. 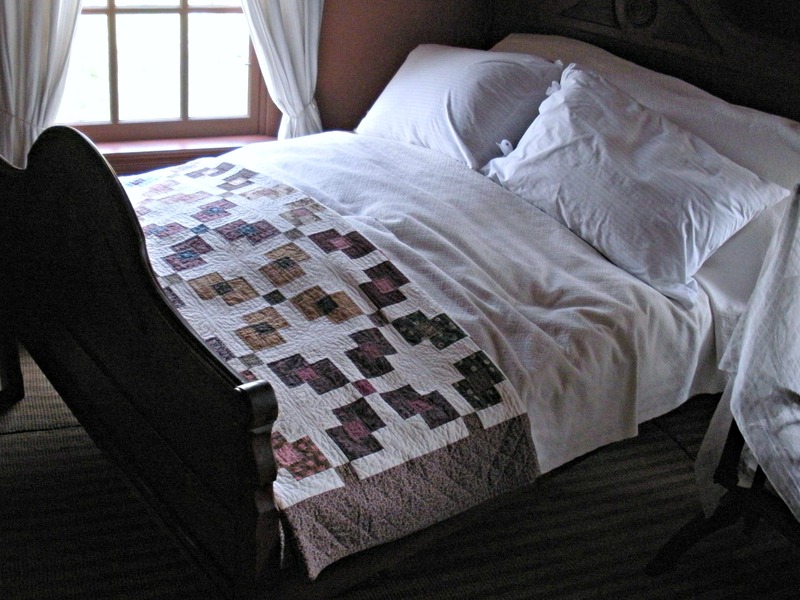 But acknowledging that many of our contemporary quilts are reincarnations of past designs and styles, and giving a nod to the history of our craft, doesn’t make our creations any less creative, any less “modern”, or any less. Period. 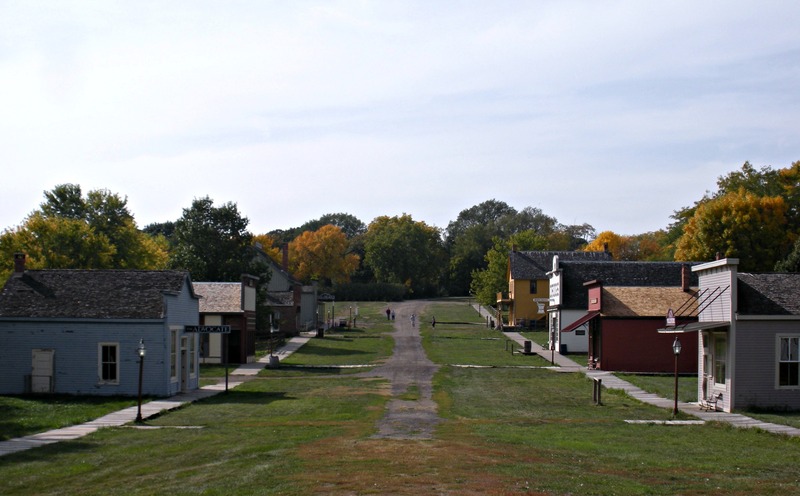 Several of our Des Moines MQG members are also members of DMAQG, and submitted projects to the show. It was fun to see MQG member’s names jump out at me as I walked around the show. And, I know there were others…but these are the few I managed to get shots of. 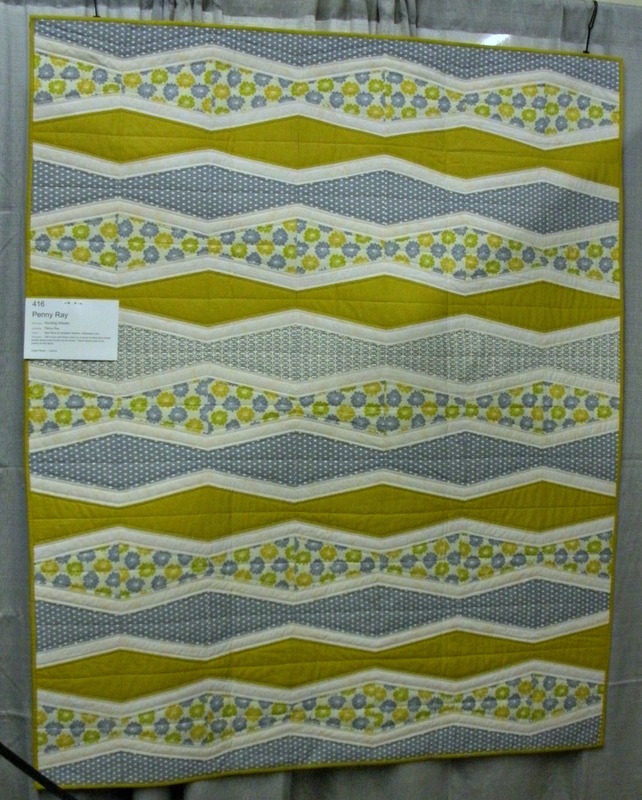 There were several quilts in the juried AQS exhibits that were of a very modern aesthetic. 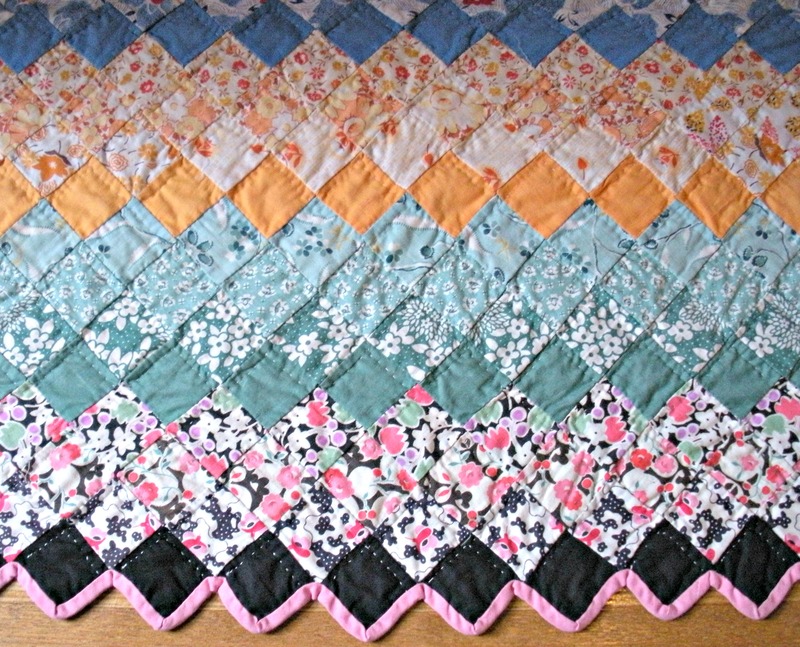 At least two wonky log-cabin style quilts, and a few pieces with the feel of a Gees Bend quilt. 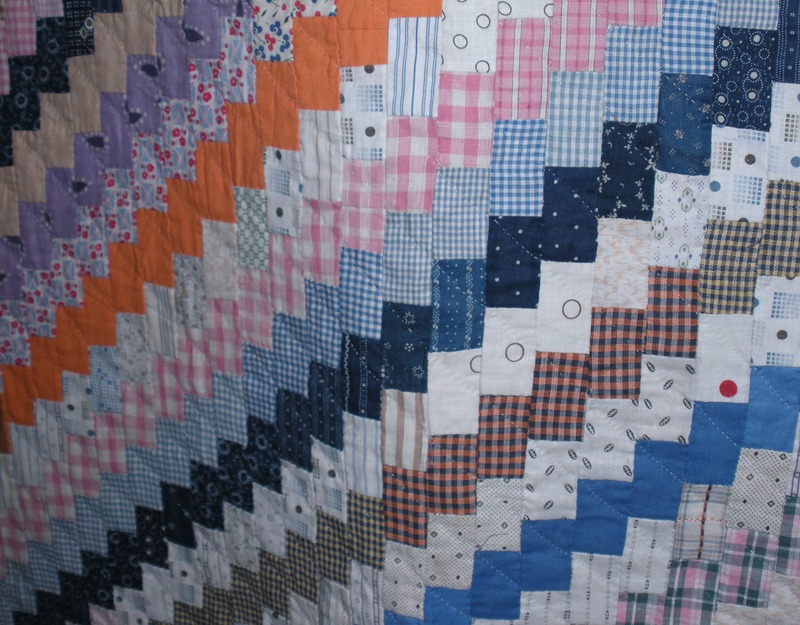 Modern or Traditional, the theme for the day was superb craftsmanship and well-executed quilting! 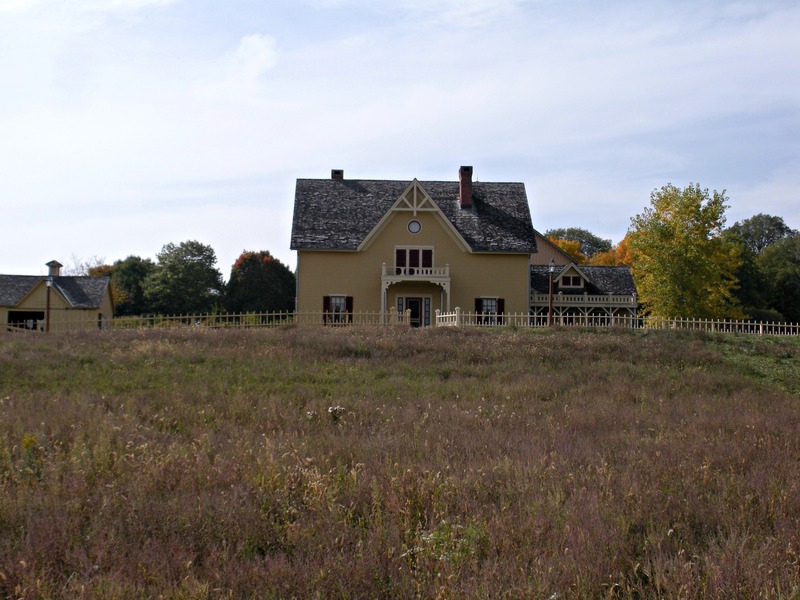 Last Sunday, my sweetie and I visited Living History Farms, a living history site that includes a recreated, fictional 1875 town, Walnut Hill, Iowa, a 1700 Iowa Indian Farm, an 1850 Pioneer Farm, and a 1900 Farm, built on the original Flynn estate (the Flynn Mansion and Barn are the two structures original to the site). 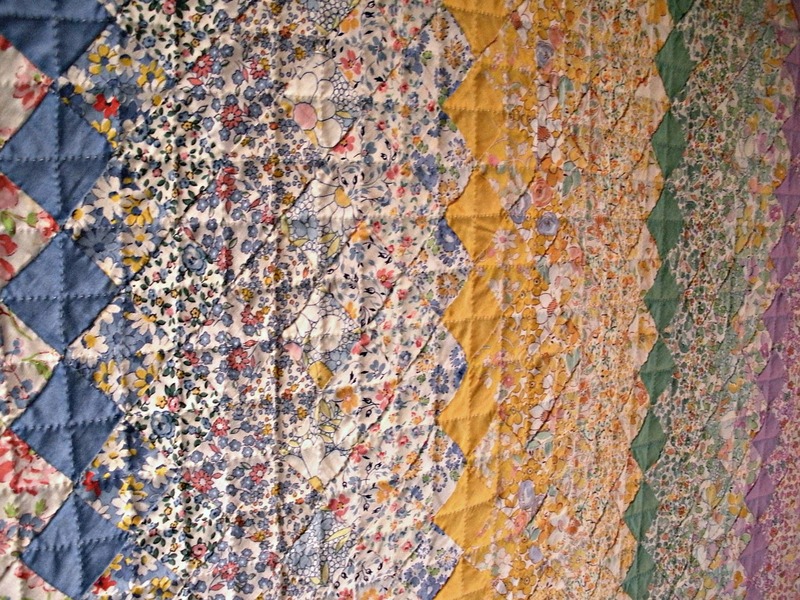 Our reason for visiting was to see the annual display of quilts from the museum collection. 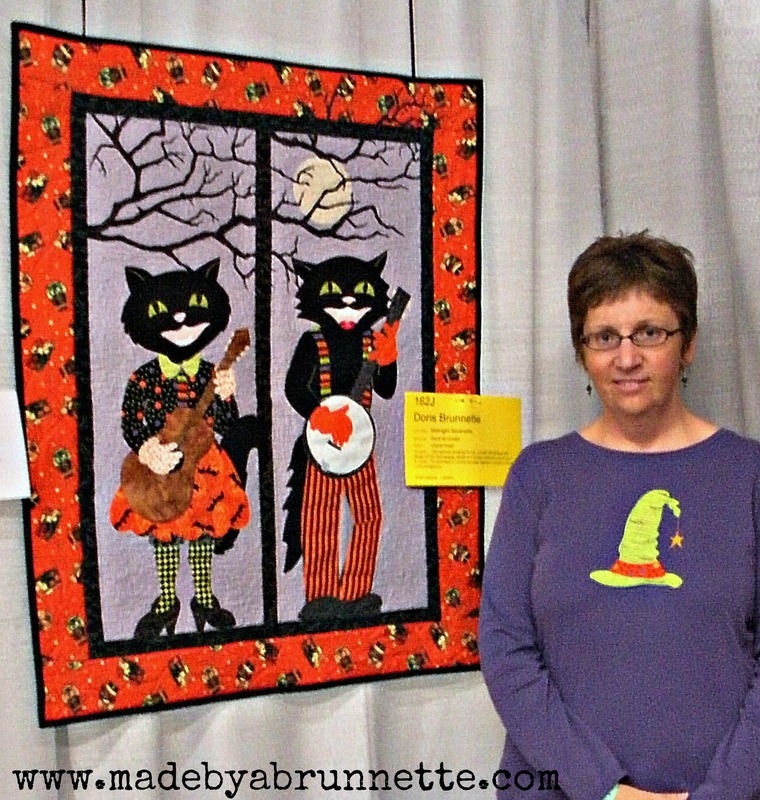 (I’ve written about this quilt show in previous years, here and here.) This year’s show was entitled The Ties That Bind. Does anyone know the name of that block pattern? 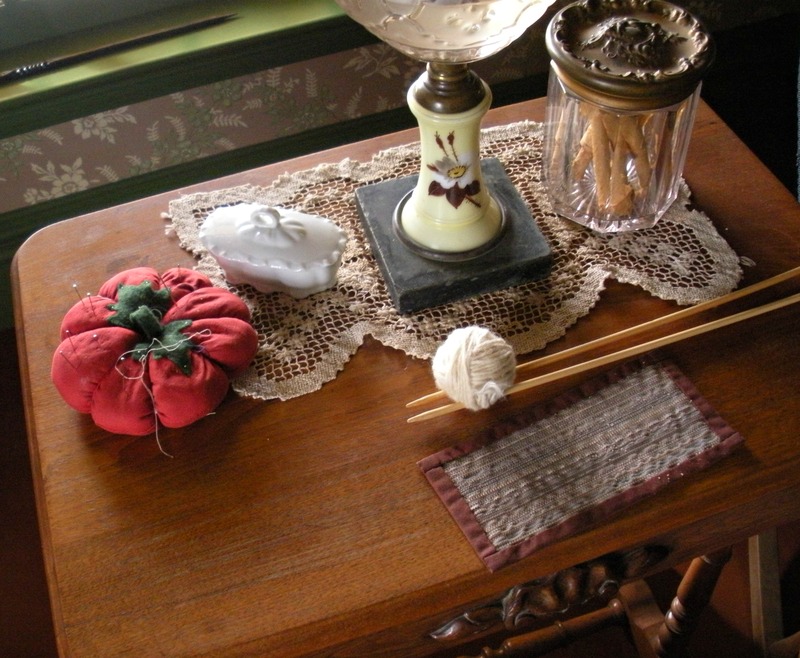 Linda identified the block from Barbara Brackman’s Encyclopedia, Tonganoxie Nine Patch, and here is a link to a tutorial on how to make it. The lighting inside the church makes it difficult to take good photos at times, but I still have some nice shots of vintage beauties to share with you. 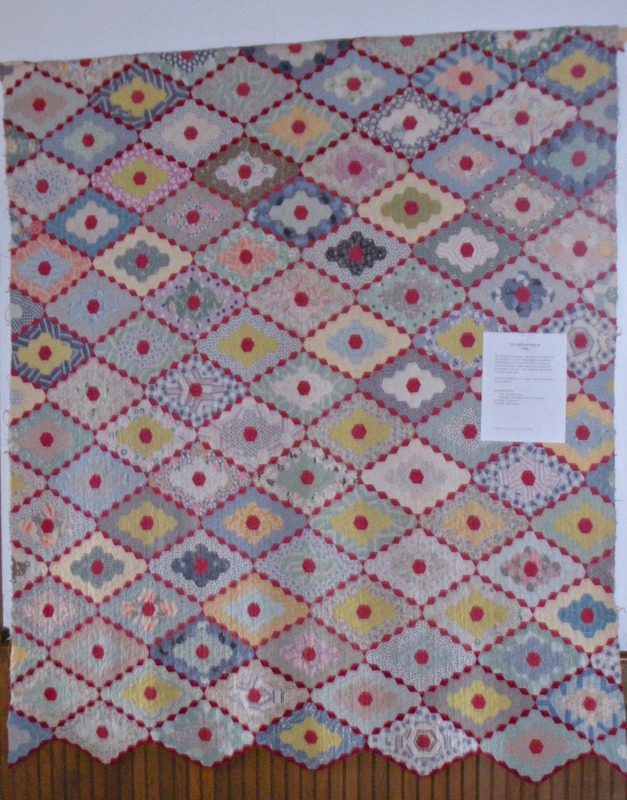 I’ll spread this out into more than one post, but today I’ll share three crazy quilts with you that were on display last weekend. 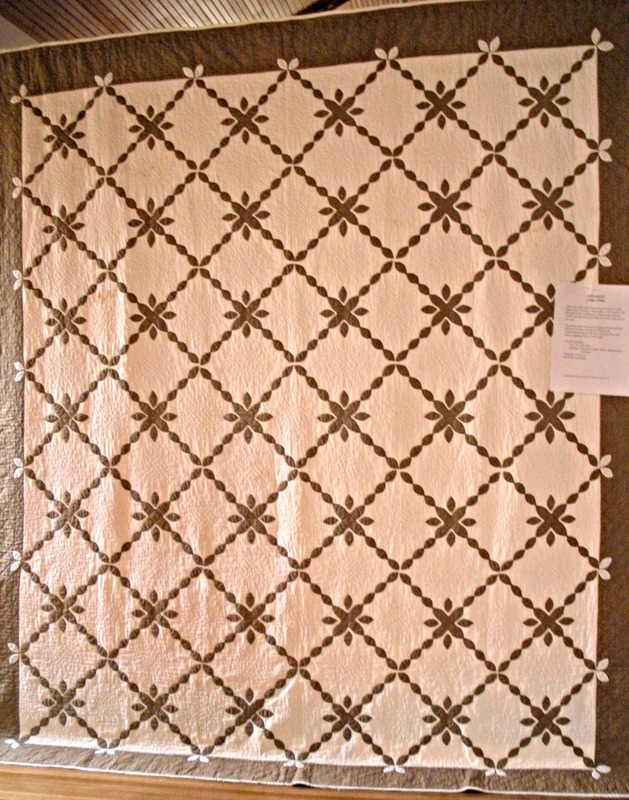 (The white rectangle is a label pinned to the quilt for the exhibit). 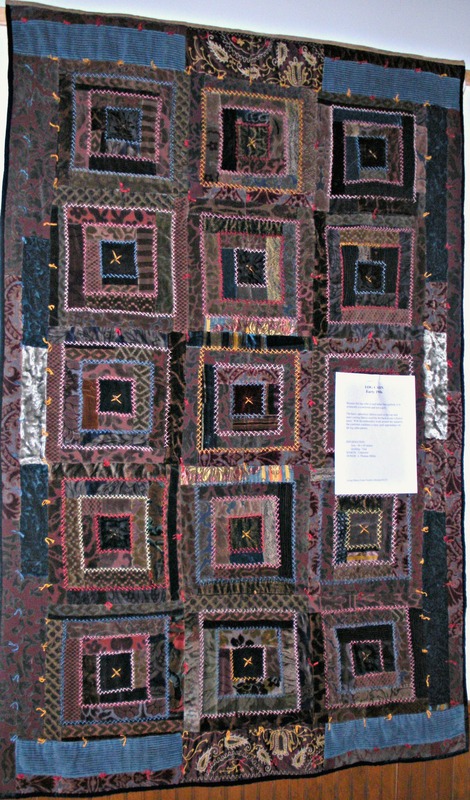 The seams of this quilt are covered in a wide variety of embroidered crazy quilt stitches, using several different colors of thread/floss. 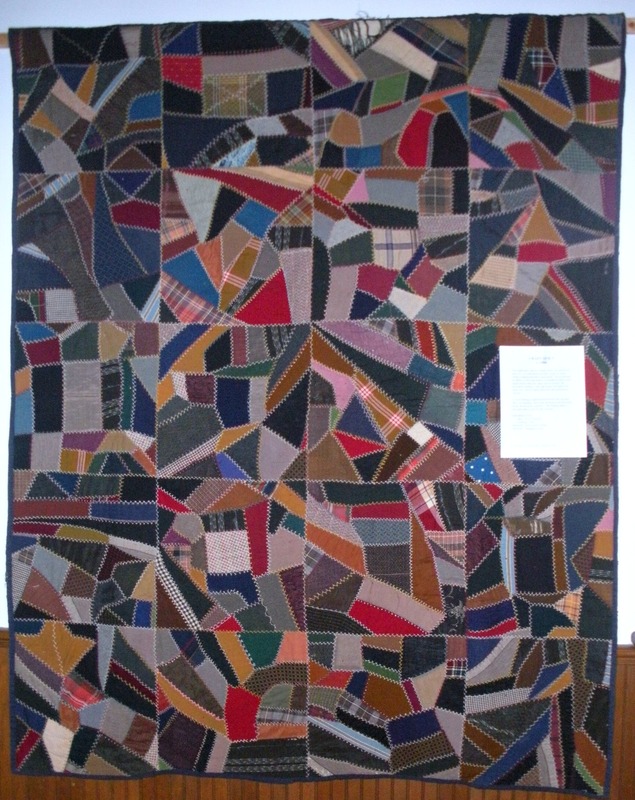 A true crazy quilt. 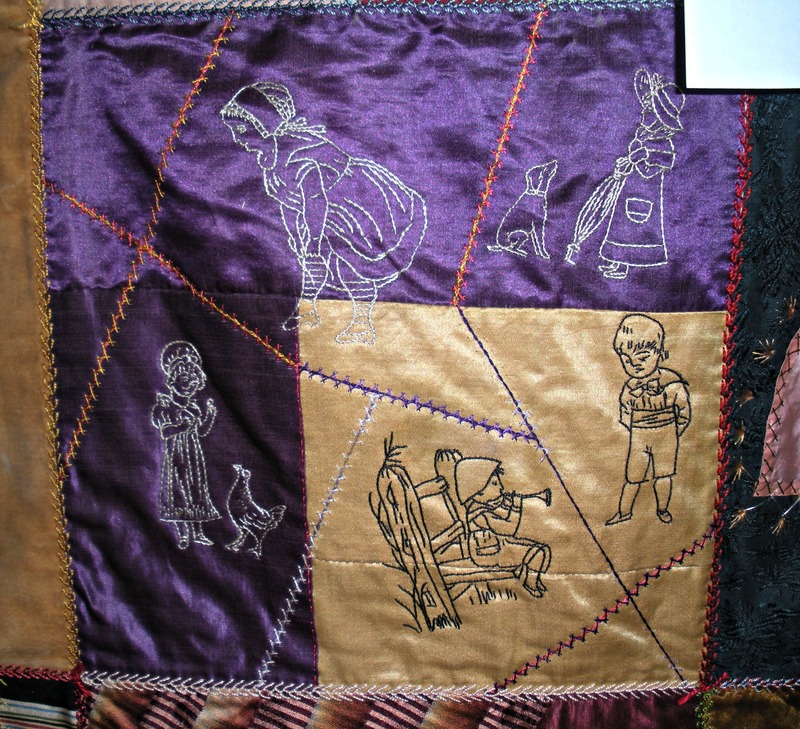 Made almost entirely from scraps of velvet clothing and upholstery fabric, it is “crazy” in the sense that the “logs” are often made up of scraps pieced together randomly, the lack of true uniformity in the log cabin (the maker intentionally made her log cabin blocks uneven), and of course the decorative, colored, embroidery stitches that cover nearly every seam. This is one I would have liked to take more photos of, but the lighting simply wasn’t adequate. 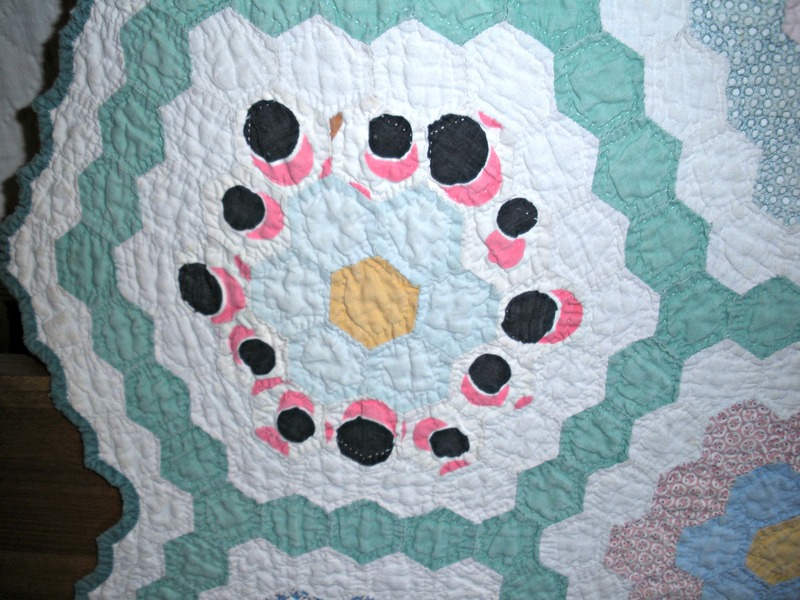 I’ll be back soon to share the pieced and appliqué quilts with you! 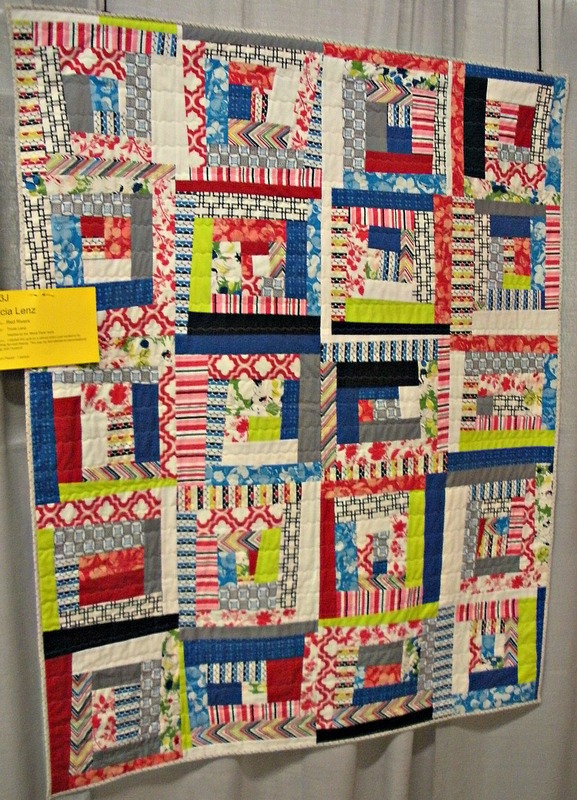 What do you think of crazy quilts? Are you a fan, or not so much? 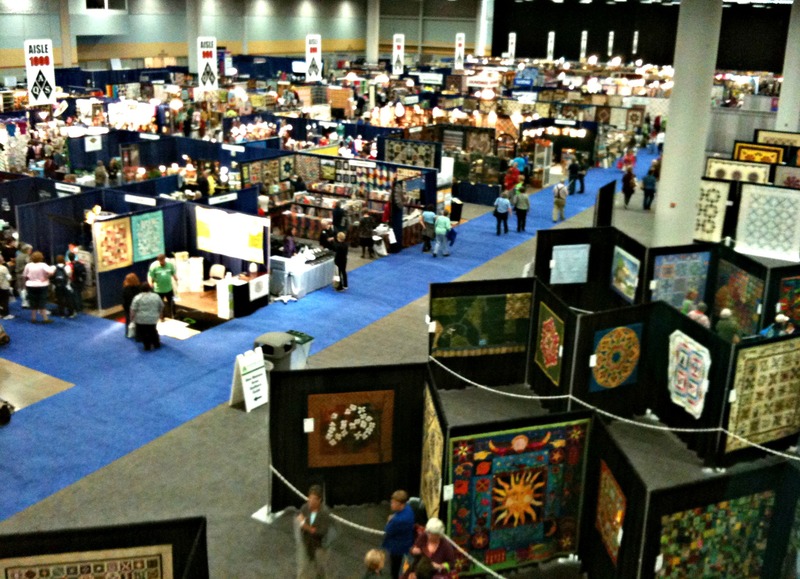 Yesterday and today, I spent visiting the American Quilter’s Society (AQS) show in Des Moines, IA. 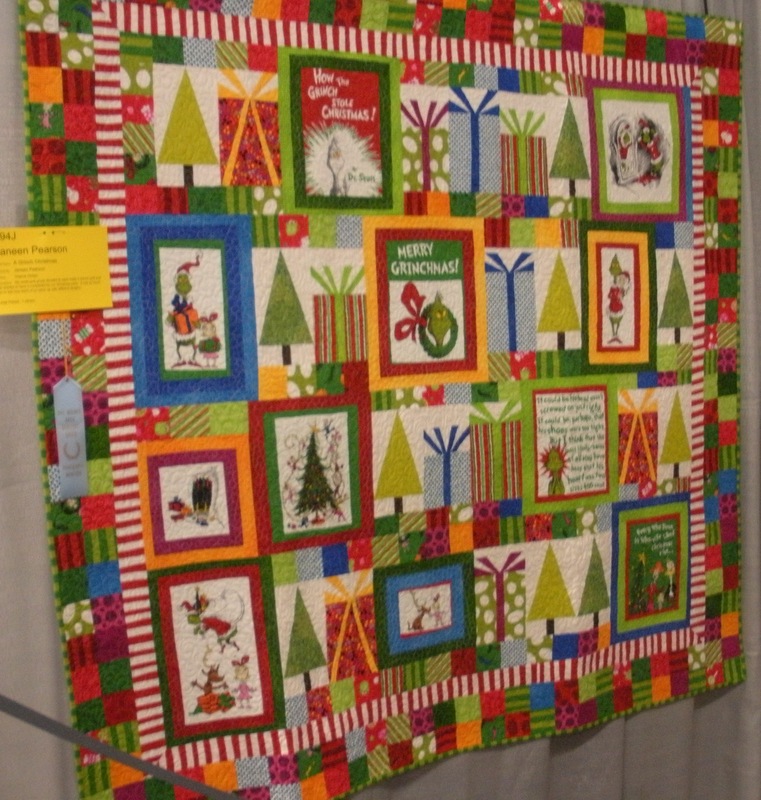 Many of my readers know this show is in conjunction with the Des Moines, Iowa, Area Quilters Guild (as in, we co-host it along with AQS, headquartered in Paducah, KY) and our annual Guild show takes place in an adjacent room, so admission to the AQS show gets you admission into our Guild show. 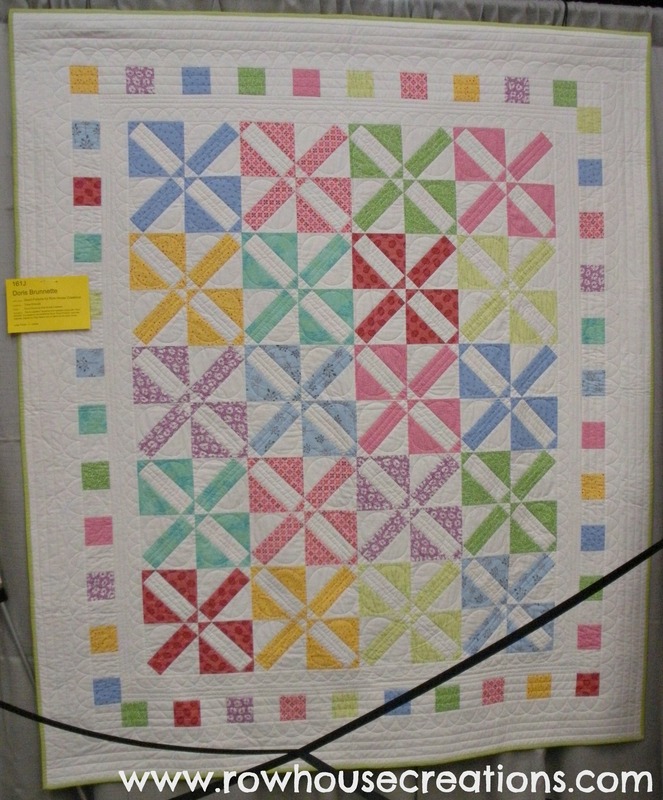 One of the volunteers told me this afternoon that the Des Moines AQS show is now the largest quilt show in the United States for number of quilts on display, in part because of the very active, and large Guild that helps to pull it off here every year. 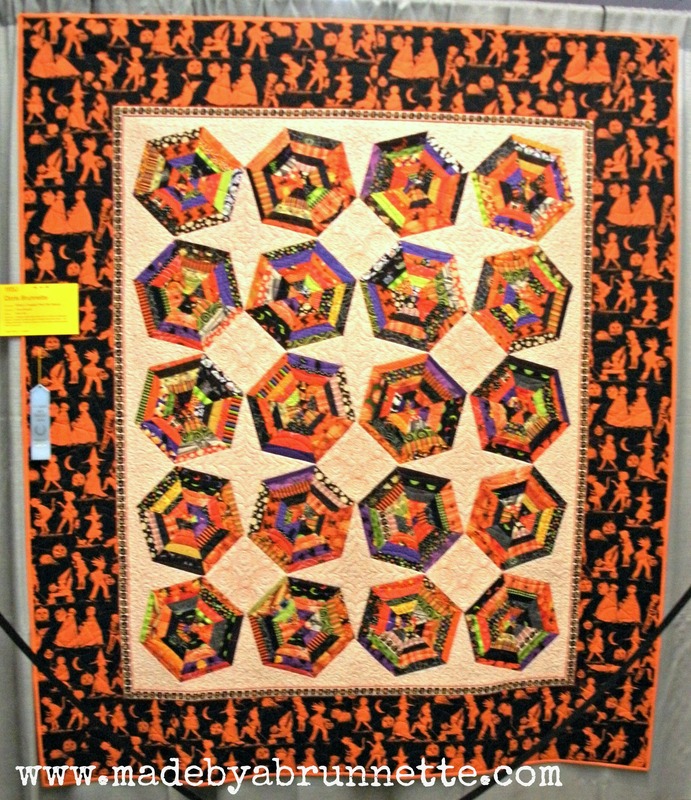 I am always anxious to share photos of the amazing things I see there (this year, there was a display of Japanese made quilts that simply took my breath away) but, AQS allows photography for personal use and enjoyment, only, therefore, no posting of photos on the internet. I will weed through my pics and see what I might have that I can show you over the next few days. I had four entries in the Guild show (one of these years I may muster up enough courage to submit something to the AQS Juried portion of the show!). 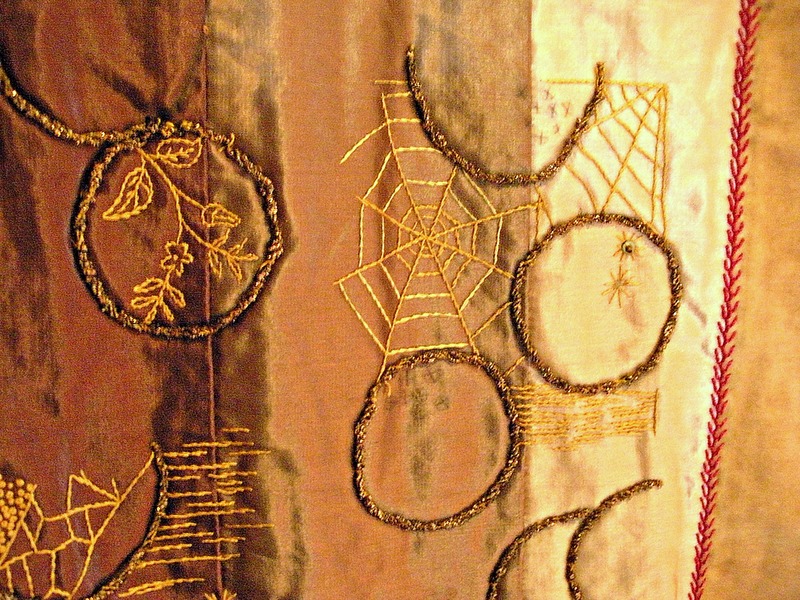 My “What a Tangled Web We Weave” Halloween quilt, first shown here during Blogtoberfest 2011 received an honorable mention ribbon. 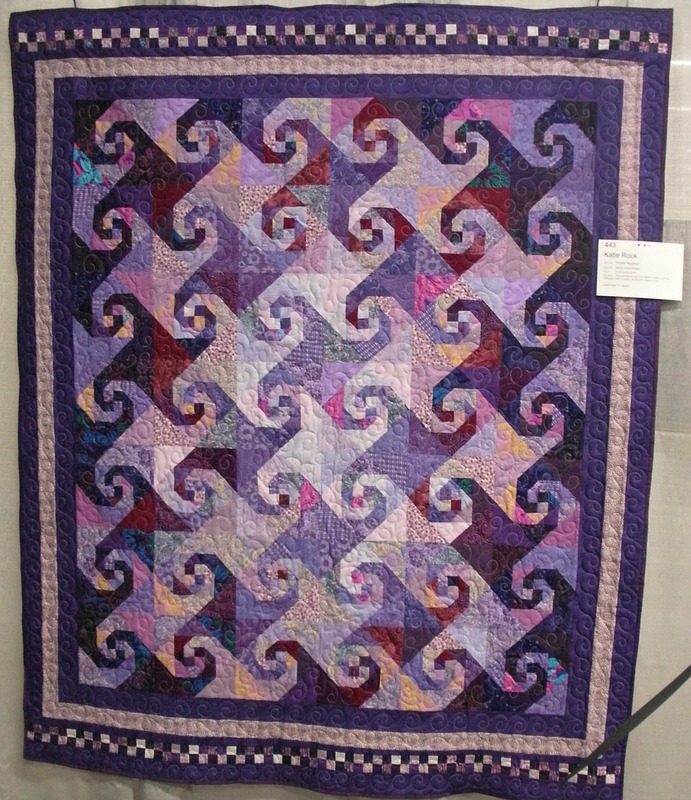 Technically, my business partner, Trina, who did the long-arm quilting on it received the ribbon–since it was the quilting that received the judges highest marks and best comments–oh well, I’ll take it!! This is a terrible photo, but I promise a full post on this fabulous finish with great outdoor photos, soon! (Can you tell how excited I was to be posing for the photo?!? At least I was properly attired for the holiday represented…) I ran into so many good friends, members of the Des Moines MQG, four gals from the small group I used to belong to, and our sister-small group, shop owners that sell our patterns (exciting! ), even my Gruber’s buddy Shelly P, and her sister who drove North from Missouri to attend the show on Friday! I think we must have had several near misses over the course of the day, but eventually, we met up in the same place at the same time just before they had to leave to drive home! 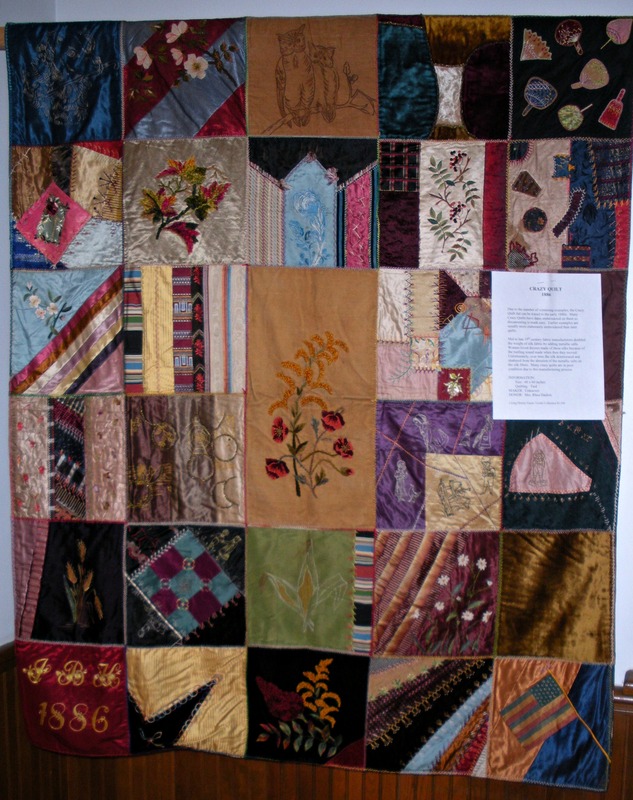 Does your local Guild have an annual quilt show? 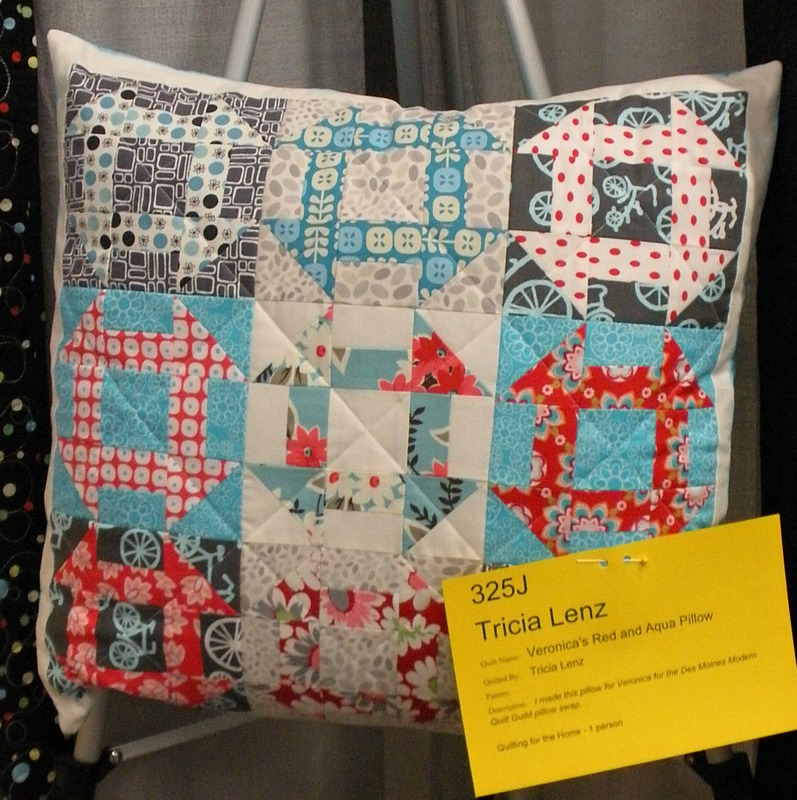 Do you enter quilts into shows or your local/State Fair?